I give you the world and everything in it. 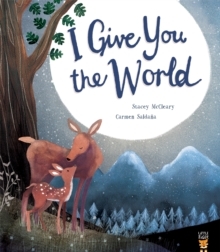 Come, let me show you - it won't take a minute... From soaring eagles and timid deer, to the winter's chill and summer's laughter, I Give You the World is a beautiful celebration of life and the natural world's many precious gifts. 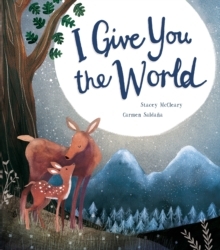 With gorgeous illustrations from Carmen Saldana (Bug Bear), this is the perfect book to welcome a new baby to the world.